Are you interested in a challenging career in a rapidly expanding and dynamic clinic? We are always interested in people who wish to contribute their skills towards the development of the clinic. 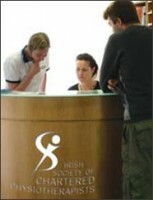 We offer a stimulating and satisfying working environment, personal and professional support and regular reviews. We are looking particularly at people who are interested in making a long term commitment to the clinic. We are always interested in hearing from highly qualified chartered physiotherapists with experience. Our current expansion has created a need for chartered physiotherapists with masters in manips who are interested in joining the clinic. We can facilitate full or part time therapists.We are looking particularly at people who are interested in long term commitments to the clinic. Therapists have a great opportunity to establish themselves permanently in this premier clinic.We have an interest in professional development and have regular clinical meetings where we share interests and advice, and support each other. We have the facility for clinical review. We are interested in dynamic candidates who will augment the skills of the current group. Chartered physiotherapist with an interest in Women’s Health. Chartered physiotherapist interested in Occupational Health/Ergonomics.